You know how sometimes you feel like changing it up? Having a little fun? Doing something different? Van's Natural Foods gets it. Recently, Van's Natural Foods had a lot of people tell them how much they enjoy Van’s products – the simple deliciousness of great food. So they decided it was time to make a little change, to shake things up, to adopt an updated outlook with their new tagline, Van’s Simply Delicious. While their tagline has changed, their products have not. Please know that they are staying true to what’s always been important to them – seriously wholesome, seriously tasty foods. For almost a half century they've been cooking up tasty, good-for-you foods starting back at the original Van’s restaurant where they first dished up whole grains and gluten free hot ‘n toasty treats. That’s what means the most to them and they know it means the same to you. So cheers to simply delicious foods – from Van's Natural Foods to you. Sweet Sensations by the Spoonful! Packed with 17g of nutrient-dense whole grains and 6g of fiber per serving, our new gluten free Cocoa Sensation™ cereal brings you crunchy, chocolatey deliciousness one spoonful at a time. Pour yourself a bowl for a sweet and sensible start to the day! Wake up with a Blissful Breakfast! New to the cereal aisle, our gluten free Blissfully Berry™ cereal delivers 17g of nutrient-dense whole grains along with 5g of fiber per serving. So go ahead and add a splash of strawberry to your morning routine. Make your morning more heavenly with Cinnamon Heaven cereal! 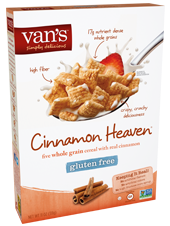 With 17g of nutrient-dense whole grains and 5g of fiber per serving, Van’s gluten free Cinnamon Heaven cereal is the perfect way to start your morning. So, dip your spoon into a sweet touch of cinnamon and say hello to a whole new, whole grain way to start your mornings. Whole Grains + a Sweet Touch of Honey = Gluten Free Goodness! Try the new and improved flavor! 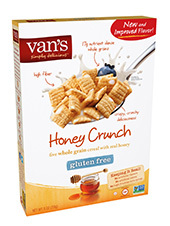 Van's gluten free Honey Crunch cereal is packed with 17g of nutrient-dense whole grains and 5g of fiber per serving. Dip your spoon into a sweet hint of honey and say hello to a whole new, whole grain way to start your mornings. Van's Natural Foods Cereal is a great way to start the day! I love that Van's Natural Foods has four varieties of gluten free cereal to choose from. So you're sure to find a flavor that's perfect for everyone! My family loves cereal and these days we're tying to find ways to eliminate gluten from our diets, or at least my seven year old's diet since she has some sensitivity to gluten. 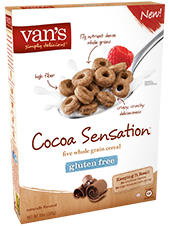 Each variety of Van's Natural Foods Cereal tastes wonderful and didn't last very long in our house since it tasted so good. I really like that each variety contains five or more grams of fiber per serving and seventeen grams of whole grains. I found Van's Natural Foods Cereal to be very filling and enjoyed it so much that I even snacked on it at night. 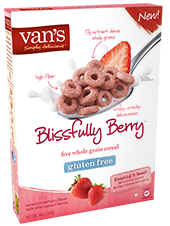 Click HERE to learn more about about Van's Cereals! Click HERE to see other products by Van's Natural Foods. Click HERE to locate a store near you that sells Van's Natural Foods. Follow Van's Natural Foods on social media! Van's Natural Foods Back-to-School Giveaway! This is a new brand to me, but it sounds like they have a lot of variety! I want to check these out. I love natural foods so I will have to look for this brand. I think the cocoa sensation sounds like it would be yummy. I haven't tried any of the Van's cereals, but think I'd love the Cinnamon Heaven! Definitely on my grocery list for my next shopping trip! I'd definitely like to try more of these cereals. They all sound great! I have never heard about this brand but it sounds great!! I need to check-out this! !